A highly pigmented loose mineral foundation contains antioxidants, soothing botanical extracts and a light aromatherapy. Start by opening the lid of the jar and poking 4 or 5 holes in the label that covers the sifter in the top of the jar. Screw the lid back on and turn jar over and gently shake a little of the loose mineral foundation into the lid. If you remove the label there will be too much mineral foundation in the lid. Remove the lid and swirl the Lush Kabuki brush in the powder to “load” the brush. Gently apply the mineral foundation on to the face in a buffing motion. Wait a second in between applications. The natural colorants in the mineral foundation will warm up with your body tempature and start to develop on the skin. If you need more coverage, repeat. 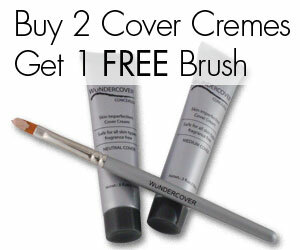 You can use WunderMinerals all over the face, even on your eyes. Just close your eyes while buffing the face and apply the natural makeup in the eye socket. It will give a nice base for eyeshadow.